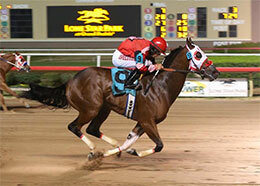 Ivoriona, under jockey Jorge Torres, was easily the fastest qualifier in Friday's Grade 1 Speedhorse Lone Star Paint & Appaloosa Futurity trials. in Grand Prairie. GRAND PRAIRIE, TX�OCTOBER 14, 2016�Ivoriona, racing for the partnership of Mickey Johnson & Randy Hill, trained by Randy Hill blew away the field in the first Speedhorse Lone Star Paint & Appaloosa Futurity(G1) trial of the night posting the fastest qualifying time of 19.763 seconds at 400 yards on a good track. The filly earned a 92 speed index over the we sealed racing surface. Ridden by Jorge Torres Ivoriona, a daughter of IVORY JAMES, broke from the outside post and already had a two-length advantage over the field at the first call. She set the bar so high that none of the other 23 contenders could get under the 20 second mark. A repeat performance in the final $34,700 Grade 1, Speedhorse Lone Star Paint & Appaloosa Futurity to be held on Saturday, October 29, would certainly see the filly in the winners circle. For a complete list of the ten finalists to the Speedhorse Lone Star Paint & Appaloosa Futurity with qualifying times, sires, dams, owners, breeders, trainers and jockeys CLICK HERE.